Media and Contents: Soft cover; 88 pages plus covers; high quality glossy presentation in portrait 8.5” x x11” format; eight colour profiles; five monochrome profiles; special markings and shark mouths illustrated separately in colour; 125 historical photos. Advantages: Very comprehensive photo and profile coverage of the colours and markings of the A.V.G. ; gorgeous profiles; nice to see a plan-view upper surface scheme in colour; excellent wartime colour photos; interesting discussion of colours and markings; three associated decal sheets from EagleCals. 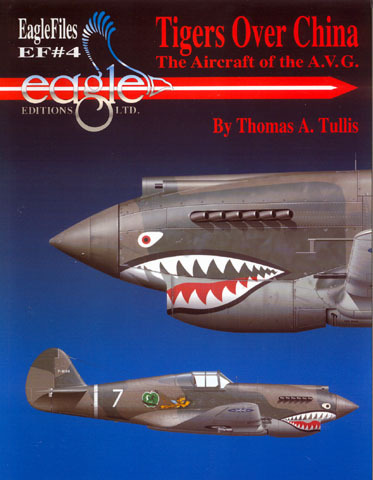 and Tom Tullis illustrated his book, “Augsburg’s Last Eagles”. Tom Tullis has an obvious passion for the aircraft of the A.V.G. Better known as the “Flying Tigers”, the American volunteers from the US Navy, Army and Marines all “resigned” to fly for the Chinese Air Force between August 1941 and July 1942. The American Volunteer Group downed a remarkable total of 286 Japanese aircraft with their Hawk 81s (P-40B) and P-40E over this short period. The author has been involved in several projects related to the A.V.G. over the last decade. Although many books are available on the history of the unit, the men and their missions, information about the colours and markings of the aircraft themselves was sparse. Original research was therefore undertaken, combined with extensive interviews with the surviving A.V.G. pilots. This is not a book about the exploits of the A.V.G. and its pilots. The author clearly outlines the scope of the book in his introduction. “Tigers Over China” is intended to supplement the existing histories and biographies of the Flying Tigers with illustrations resulting from the author’s extensive research. The result is a real treat for modellers and aviation enthusiasts alike. The heart of this book is the colour artwork. Eight colour profiles plus a colour top plan view are supported by two colour pages of shark mouth and marking variations. The quality of Tullis’ artwork is up to his usual superb standard. His treatment of light and shadow, weathering and minute detail is superb, yet does not draw attention away from the overall lines and colours of the subject aircraft. Two more pages add another six profiles in black-and-white. Frankly, variety of colour schemes is not one of the features of the AVG. The loss of colour on these pages does little to detract from the usefulness of the illustration to modelers – simply refer to the colour profiles and marking guides if you need help identifying the colours of the squadron band or the sharks gums! The subject for all the profiles are Hawk 81-A2s. One of the pleasant surprises of the book is seven pages of wartime colour photographs. These give an excellent impression of the camouflage and marking colours used by the A.V.G. and the uniforms of their pilots. The remainder of the book is packed with over 120 photos of A.V.G. aircraft, both Hawk 81s and P-40Es. The quality of the photos is generally very good considering their age. They exhibit the range of the markings carried by the Flying Tigers over their short history. Text is thin but useful. A few paragraphs of history make way for the story of the colours to be largely told by the photos and profiles. Several additional pages of text describe the camouflage colours, sharks mouth variations, squadron markings and other markings. Despite the brevity of the text, it does reveal a few previously little known and interesting facts about the colours of the A.V.G. “Tigers Over China” is an excellent reference source for the colours of the A.V.G. It will be ideal for modellers, especially with the availability of three associated decal sheets from Eagle Cals (also reviewed here on HyperScale).